When dining out at Westmeath you have a wide variety of restaurants to chose from. There is casual dinning, Irish, Modern Irish, Seafood, International and Vegetarian. Just to name a few. The Irish Grove, in Althone, has a relaxed and modern atmosphere, hot food, excellent service, as the waiting staff are friendly and professional, and a great location, right on the river Shannon and overlooking the Althone castle. It is a great restaurant for the whole family. They have a children's menu, al carte menu or they will arrange a set menu for large groups, if requested. It has a full menu, including steak, chicken, fish, pasta. The sticky toffee pudding is wonderful. There are a large number of sections, so if you want a intimate dinner for two or a large group table this is the place for you. The Kin Khao, in Althone, specializes in Thia cuisine. The decor is fresh and energetic. The staff are friendly and the food is pleasing. 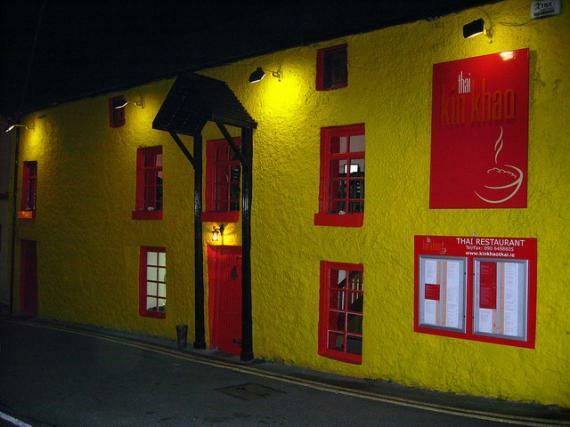 One of the best Asian restaurants in Ireland. Oscars, in Mullingar, serves European and Irish cuisine. It has a relaxed atmosphere and friendly staff. The food is excellent and caters to various tastes. They have a new early bird menu, for great value. New dishes include chicken volcano and cod chunks in a mango salsa. This is delicious. The Tyrellspass Castle restaurant, in Tyrellspass, serves Irish cuisine. It has good food and service in a charming setting. Menu includes roast beef, egg may, country vegetable soup, lasagna, and vegetarian lasagna, bread, butter, salads, coleslaw, potato salad, apple crumble, and much more. The restaurant is located in an old castle, very neat environment. The Motte and Baily restaurant and Egan's Pub, in Moate, is a pub restaurant that has friendly staff and good food. It has a Georgian dining room.